Last week I showed you a couple of the distractions that I have been working on recently. Now, here are a couple more. The school at which I volunteer has an fundraising auction every year. Each homeroom class comes up with a project. And I have been also teaching art and have the students there working on projects as well. Last week, I revealed the Hand-carved Minion Soap set and the painted country glass set. This week, the other two projects from my art students! The first project is an amazing chess set made by three of my students. 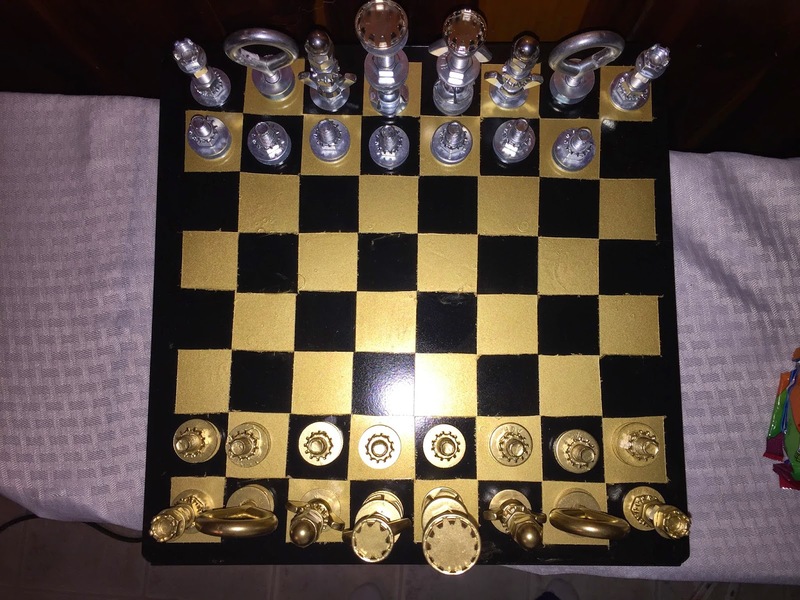 I went to the hardware store and just grabbed a bunch of random nuts and bolts and told them to create a creative chess set. After working with them for a few class periods, they had figured out what else they needed and exactly what they wanted the chess set to look like. Then, they made all of their pieces, super glued them together and spray painted one set gold. The chess board took a bit more creativity as they wanted it to be metal to go with the pieces, but they really wanted it to have a drawer to hold the pieces. They settled on a Keurig K-cup drawer, made to go under the Keurig coffee machine. 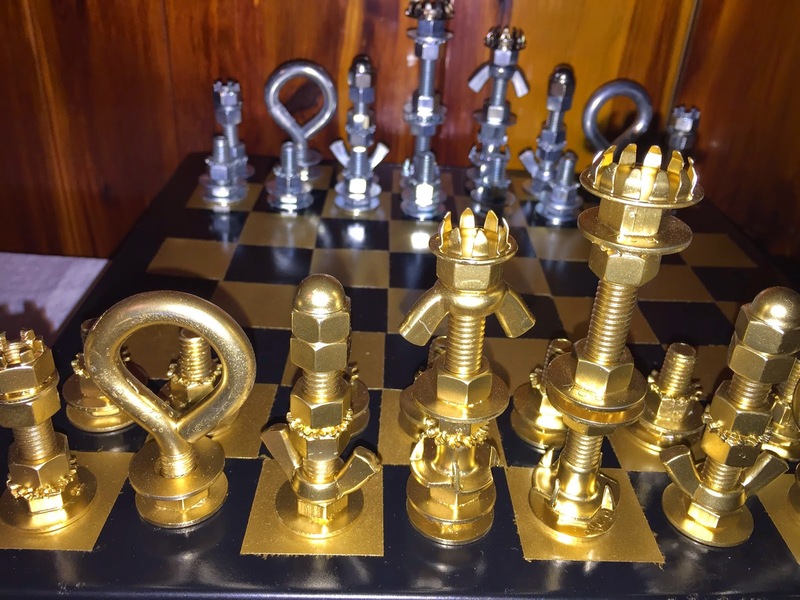 They marked off the squares, spray painted them gold and Ta Da ... A gorgeous Nuts & Bolts Chess Set! I can't wait to see how it does at the auction! I have a group of foreign exchange students from China in my class as well. 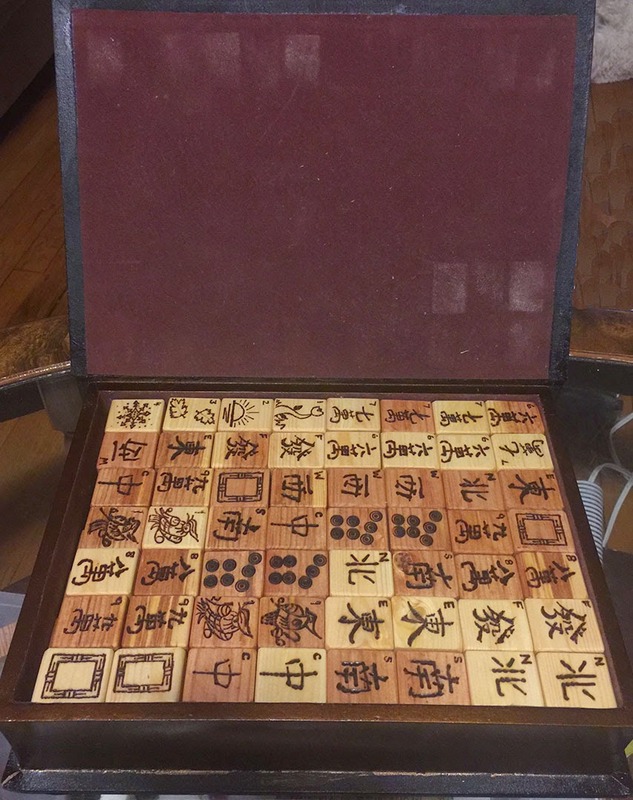 They had several choices of projects to work on, but decided that they were going to make a traditional Chinese Mahjongg Set. This was a massive undertaking as they had 136 tiles to create. 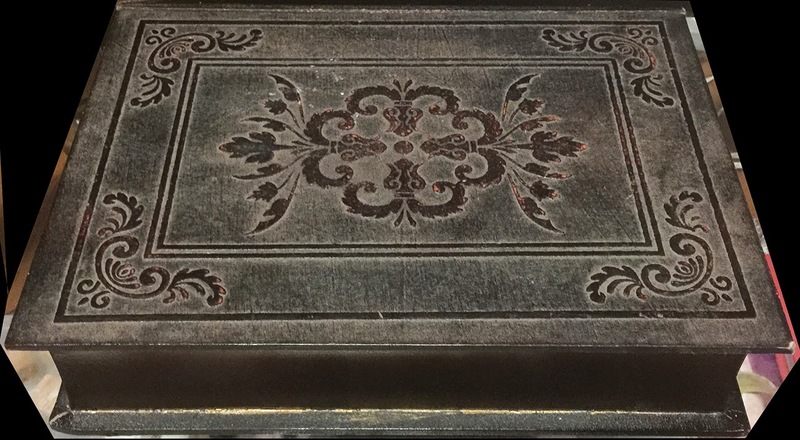 They chose to go with a wooden tile so they could wood burn the intricate designs. We got the wood pieces made from a listing on Etsy and then the kids set to the task. Each piece of wood needed to be sanded to give a softer feel and curved edge. Then the drawings were done and then finally, the wood burning was started. Luckily we were able to find a woodburning stamp for the circles to make the look clean. While it did take a bit longer than expected, the results were nothing short of amazing! After the tiles were done, we had to figure an easy way for the game to be transported. Off to the craft store!! Currently there is always a large selection of giant empty books at all of the craft stores, and I have always thought they were very cool! So, I bought the biggest one I could find and it actually fit the tiles perfectly! Absolutely awesome! I am very proud of all of my art class projects! I am looking forward to see how well they do at the auction, but even if they didn't make any money, I couldn't be happier with the hard work of my students! Recently, there are have been a high number of things distracting me from what I was considering my most important goals. However, I am now looking at all of these distractions and thought that you might just be interested in seeing what I have been up to. So, over the next couple of weeks I will let you all take a glimpse at what is going on in my head! I volunteer teaching art at a small local high school. The school has a fundraising auction every February. I also am a class parent for the junior class. So, combining all of those, I am going to end up contributing at least 5 projects for the auction. In this article, I will tell you about two of these beautiful projects. The first project is a beautiful glass set that a group of art students painted. It comes with a carafe and four mason jars with lids and straws. 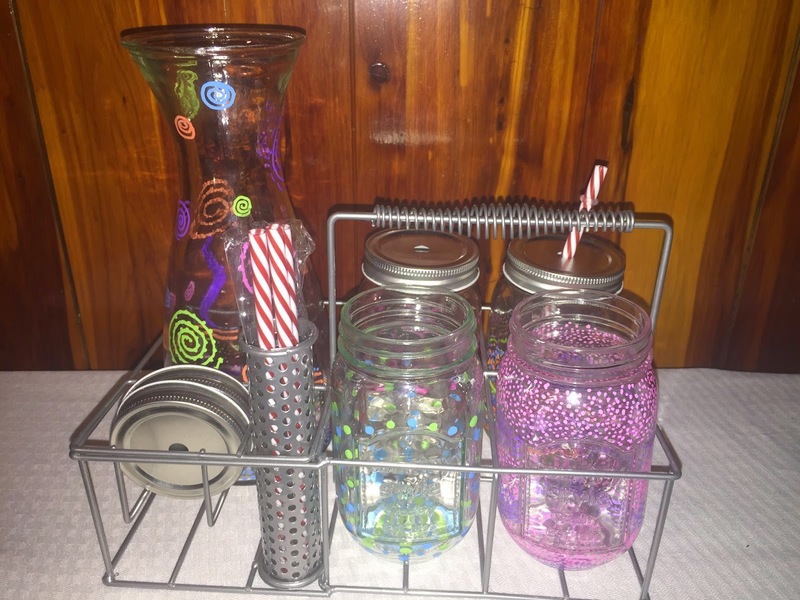 The students created patterns of dots and lines and swirls to make the glass look festive and ready for summer fun! The next project was done by a group of international students from South Korea. We took a large batch of Ivory soap bars and started sculpting away. At first, it was just for practice and play and fun. But, as we continued on, I encouraged them to find a design they could all agree on so they could make a batch of soap for the auction. Their final decision was to make a batch of soap in the shape of Despicable Me Minions. They turned out great! Hopefully they will bring in some money for the fundraiser. I am not sure that I could actually use them because they are so cute! I think both projects turned out fabulously! 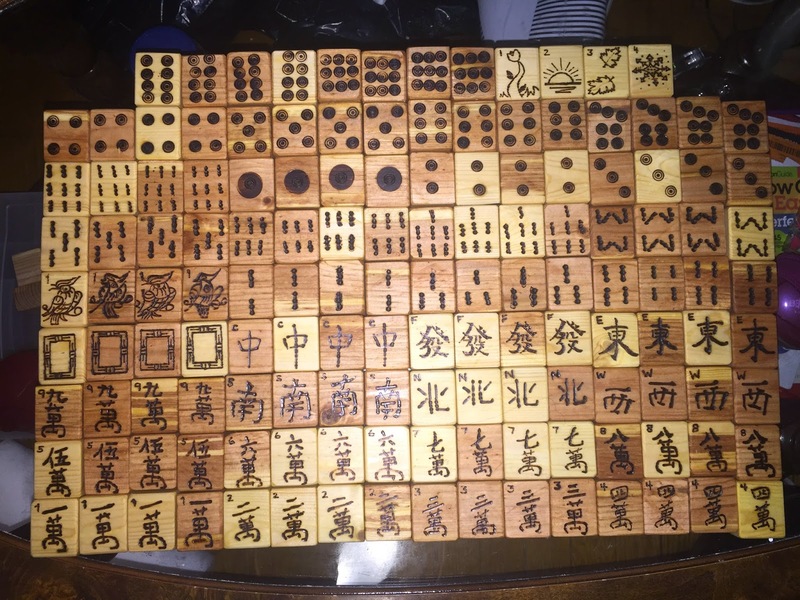 In a few days I will show you the other two, larger projects from my art class: a chess set, and a mahjong set! Well now you know a couple of things that have been on my mind and plate, just wait to you see the rest!